Have you wanted to straighten your smile for years but haven’t because you didn’t want to get metal braces? Many of our adult patients feel this way because they don’t want to compromise their professional appearance, and for them, we’re happy to offer Invisalign. With Invisalign, Dr. James Hart can give you the straighter smile you’ve always wanted without any noticeable brackets or wires. 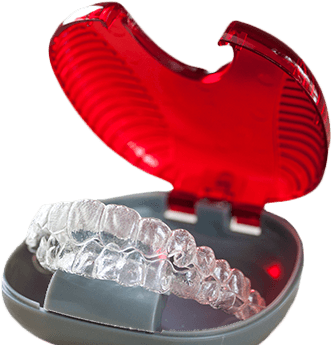 Invisalign uses a series of custom-made aligner trays to straighten the teeth. They’ll be designed to fit your smile by Dr. Hart, and you’ll simply need to wear each individual set of trays (one for the top and bottom teeth) to gradually transform your smile. You’ll be instructed to wear one set for about 2 weeks for 22 hours a day before progressing onto the next one. After you have gone through the entire series, your smile should be completely straight. It’s just that simple! Discreet Appearance: The trays are practically invisible when worn on the teeth, making Invisalign one of the most subtle orthodontic treatments in the world. Comfort: The smooth plastic will be specially shaped to fit your teeth and keep you nice and comfortable throughout your treatment. Convenience: You can simply take the trays off whenever you need to eat or brush your teeth, allowing you to maintain your normal diet and oral hygiene habits while improving your smile. This is a decision best left up to you and Dr. Hart. After a thorough examination, he’ll let you know if Invisalign is right for your smile or not. If it is, then he can begin treatment almost immediately, and in just a matter of time, you’ll be seeing a beautifully straight smile in the mirror. In order for your Invisalign trays to have the appropriate fit, we’ll need to take a dental impression. In the past, this usually meant we had to fill your mouth with a gooey, odd-tasting impression material, but now, thanks to our iTero Digital Scanner, we can take care of the entire process digitally. This small device will capture and use dozens of unique images of your teeth to “stitch” together a fully 3D model of your bite. This approach is faster, more comfortable, plus it yields a much more accurate impression, ensuring the success of your Invisalign treatment.